I grew up adding hot sauce to every meal, and I still do. It was always a staple in our household, my father being a master saucier and hot pepper chef. Our meals were regularly hot and flavourful. Over the years I’ve developed a healthy addiction for spicy foods. I usually have at least ten types of hot sauce in my fridge at any given time, and usually much more. I’ll admit that my favourite spice is fresh cracked pepper straight from the mill. Cracked pepper opens-up your taste buds, allowing the true flavours of your food to develop. After all, next to gold, pepper is what Christopher Columbus sought when first coming to the Americas. When I eat in restaurants I often spark up a conversation with my server as they crack pepper onto my plate, never saying ‘when’ until I must. But cracked pepper isn’t nearly enough to satisfy my cravings, but then, neither is just pure heat. I need a good hot sauce that bursts with flavour. My father grew up in the tropical islands of The Bahamas, where he acquired his passion for working with hot peppers. I spent my childhood eating spicy conch salad and playing in the waves. We still travel to The Bahamas today in search of the elusive goat pepper or grouper to spear. With decades of production experience, my father is now appropriately labeled ‘The Peppermaster.’ He uses a wide variety of fair trade sourced peppers and focuses on their individual flavours, effectively drawing out the aromas of each unique pepper variety. His countless cooking sauces, spicy elixirs, infusions and pure pepper mashes have been delighting hot sauce aficionados for decades. I could easily get lost in a pantry of his products, cooking delicious meals and creations to my heart’s content. As his son, I know his products and capabilities like no one else, having worked alongside him in his production facility since childhood. But I’ve often felt that there was something missing. Something so simple and yet so very complex. A hassle-free sauce to put right on the table alongside the salt and pepper. Something to add a burst of flavour and spice to every meal. So, I approached the Peppermaster with my concepts and together we developed my vision. Like him, I sought to highlight individual pepper varieties in each of my sauces, with the flavour of each shining through, much like how fine wines concentrate on one grape variety. I proudly bring to you an authentic product line using the peppers less traveled; cherry peppers, bell pepper, bird’s eye, the elusive Bahamian goat pepper, and even the hottest pepper in the world, the Carolina Reaper. And I’ve just added a new ten-pepper sauce with many hidden gems coming at you from every angle. 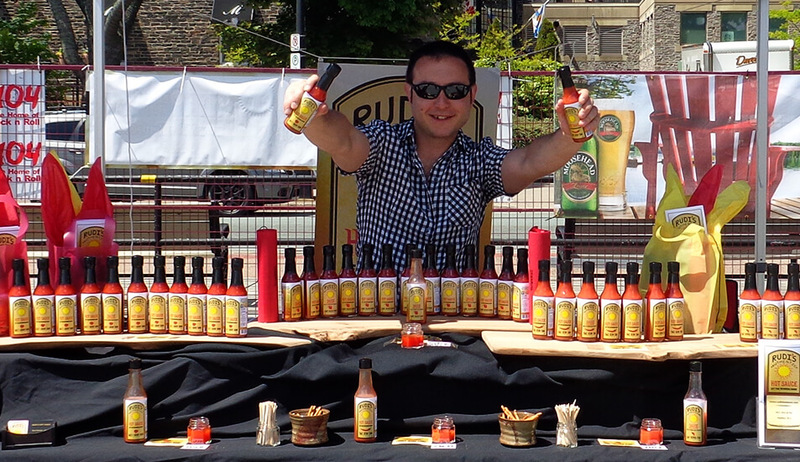 Rudi’s Hot Sauce proudly produces seven different hot sauces, ranging from extra-mild to scorching extra-hot. Rudi’s Hot Sauce adds a burst of life to your food. Made by a father-son team that’s changing the world, one pepper at a time. Look out, the expertise of the Peppermaster combined with Rudi’s visions and marketing experience is a match made in pepper-heaven. With over a decade of experience in the Food & Beverage industry, and a life-time of eating and cooking hot and spicy foods, I can assure you that these sauces will deliver all that you seek in a hot sauce and so much more. But I feel obligated to warn you…these products are highly addictive, trust me, I am currently addicted to them myself. The colours alone will make you want to buy it, but its the flavour and heat that will draw you back for more. No preservatives, all-natural, gluten-free, no GMO’s, corn-free, peanut-free, organic and fair trade supporting ingredients like Peruvian cane sugar, distilled grain vinegar and fair trade organic tapioca starch, …just pure love and only the highest quality ingredients we could source. Generations of talent condensed into a little bottle that will make you crave your next meal.